The price of the "BNR4VAPJ4" disc is expected to be about 1,500 yen ($13.4) per disc, with sony to also offer 3-pack and 5-pack options for 3,900 yen ($34.8) and 6,000 yen ($53.5), respectively. Until now, BDXL recordable discs featured 3 recording layers and a maximum capacity of 100GB. Sony says that adding an extra recording layer required a combination of "unique" materials in order to ensure a strong signal from all four layers of the new disc, even at 4X burning speeds. Besides the accurate and stable "burning" of the data marks on the disc while recording, optimizing the reflectivity and transmittance of each recording layer is required in order to achieve reliable playback. Sony reduced the recording marks by about 78.5% as compared to the shortest mark length of a 2-layer disc structure, which is translated to a shortest recording mark length of 0.117Myuemu. Each recording layer has a capacity of 32GB. In terms of reliability and data longevity, Sony used a newly resin material as an intermediate layer and adopted dielectric materials for each layer of the disc. recorders. Besides Sony, Sharp is set to launch on November 24 a new AQUOS 4K recorder featuring a built-in tuner. cool i suppose. maybe back then when 4k blu-ray players first debut over 2 years ago, it can only support and read up to 3 layer blu ray discs and that time i wasn't sure why and i thought it might have to do with reliability reading 4 layer discs. then like around last year, i read somewhere on this cdrinfo webiste that a 4k drive writer and reader can only write and possibly read at 2x speed for 4 layer blu ray discs and can't go any higher if i remember correctly. so that time i thought maybe that's why 4k blu ray players can only support blu ray discs up to 3 layers and reading up to a constant 4x speed. if supports and reads quad layer, the speed might be reduce to 2x speed. 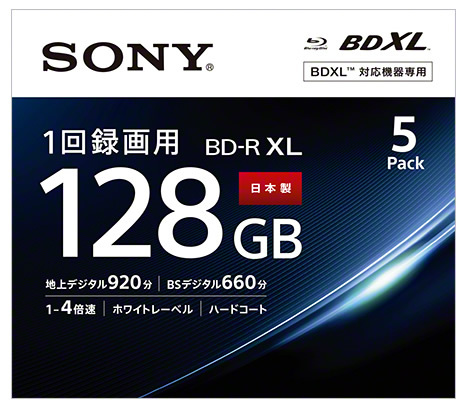 now that sony is going to release a 4 layer blu-ray BD-R discs starting next month and writing up to 4x speed, maybe even supports reading up to 4x speed, then storing 4k movies/videos at a reading speed of 4x is possible on a 4 layer 128 Gbytes discs. so now it got me thinking, so maybe reliability must be an issue back then on why 4k blu ray players don't support 4 layer blu ray discs and last year when i thought maybe the read speed will be reduce down to 2x for 4 layers disc so that is why it doesn't supports 4 layer 4k blu ray movies. i am just guessing, i could be wrong though. now that sony is about to release a 4 layer BD-R discs that can be written at up to 4x speed, maybe reading 4 layer blu ray discs at 4x speed should be no problems? lets hope so. how about is this new 4 layer blu ray recordable discs and 4 layer commercial blu ray discs be compatible to existing 4k blu-ray player that only support up to 3 layers Blu Ray discs? If existing 4k blu ray players do support reading 4 layer Blu ray discs, can it support reading it at up to 4x speed? speaking of which, i didn't even know or thought about 4 layer BD-R discs, even if i thought about it, i thought 4 layer BD-R discs has already been out for like sometimes already like 3 years already or longer. but it turns out, it haven't come out yet until next month. interesting. cool. short answer is probably no. you don't need to upgrade it because your computer is a 1st generation intel i7 and in order to watch 4k blu ray disc movies, you need at least 7th generation intel i3 or higher for it to be compatible with 4k blu ray movies. 8th generation intel i processors computers are already available for at least several months now and 9th generation intel i processor is on its way to be release. btw, is your blu ray drive a burner or its just a reader? So you should be fine with 2k blu ray movies for now on your computer you are currently having. Beside, i am kind of confuse with 4 layer blu ray discs that can store up to 128 Gbytes. i am not sure if this 4 layer blu ray discs are compatible with 4k blu ray drive and if existing 4k blu ray drives support it. maybe in the future like hopefully nearby future, i might get an answer to that. so for now, you should be okay with regular 2k blu ray discs that support up to 2 layer 50 Gbytes storage capacity. Also, btw, if your 1st generation intel i7 computer is still fast for most tasks, then maybe you should keep it for at least a couple years or so before upgrading. who knows by then, 4 layer blu ray burner and reader is more affordable. so are 4 layer BD-R XL discs. By then 10 or 11th generation or later intel i processors might come out or something like that. Hopefully by then, i would like to hear more information about HVD (holographic versatile disc) that can store data in terabyte like the 2 TBytes disc that i posted nearly 3 years ago in this board.